On July 30, 2003, a team of French and Spanish scientists from Ordesa and Monte Perdido National Park, led by wildlife veterinarian Alberto Fernández-Arias, captured the last wild female bucardo goat in the Pyrenees mountains in hopes of saving the species. They collared her and set her free. Nine months later, she died, and her species went extinct. Then, a team of reproductive physiologists harvested the goat’s cells and later implanted them into seven other goats. Six of the seven goats’ pregnancies ended in miscarriages, but one goat continued to carry the kid until its delivery. Following a C-section delivery, the clone died due to an enlarged lung. This attempted cloning—the “de-extermination” process—was the closest any researcher has gotten to reviving an extinct animal. Fernández-Arias and his group of researchers still believe de-extinction can reverse the trend of species loss, however. De-extinction is bringing many scientists, researchers, and biologists together. Last year, for the first time in history, they met at the National Geographic Society in Washington, D.C. During the conference, many questions arose about de-extinction. For example, could it be done? Should it be done? 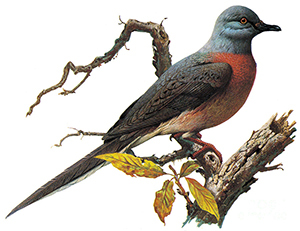 One plan put forward during the conference was to resurrect the extinct passenger pigeon. The idea was first to gather the DNA from museum specimens and compare it to DNA from its cousin, the rock pigeon, to identify what traits the bird would have when born. Next, one would need to interchange the two birds' cells and put the passenger pigeon’s DNA in the rock pigeon’s stem cell, thus creating a passenger pigeon stem cell. The stem cells would be converted into germ cells: the future sperm and egg cells that would be inserted into the rock pigeon eggs. Finally, when the eggs hatched, they would carry the sperm and the egg of the passenger pigeon. Scientist suggests that when the rock pigeons carrying the passenger pigeon sperm and the eggs bred, the pigeons that would hatch would most likely look a little bit more like a passenger pigeon. Unfortunately, de-extinction will not be available for some animals like the T-Rex. This species, for example has been gone for so long that its DNA has decayed to a non-analyzable point. Further, some people argue that reviving species through de-extinction is “playing God.” Others still favor the idea; they assert that when extinct animals are revived, some could provide us with positive ecological information. Overall, de-extinction is a very controversial topic. Researchers came close to bringing the bucardo goat back to life. Who knows, maybe we’ll even see a mammoth walking through the snowy plains of Siberia some day.